In a recent interview on ABC radio, art historian and curator Dr Vivien Johnson referred to a conversation between herself and artist Michael Nelson Jagamarra. In discussing the rise of Papunya Western Desert painting, Jagamarra remarked that “even the dots are sacred”. Jagamarra touched on something difficult for non-Indigenous people to understand: the unique relationship of Aboriginal people with their land, their spiritual beliefs and the custodianship of shared stories and community knowledge. Their worldview is one where everything has a level of sacredness. When Indigenous artists from the Western Desert began to produce paintings in the 1970s the dot emerged as the hero in the depiction of creation stories. The dot can be used to represent clan designs—in much the same way cross-hatching is used in Arnhem Land bark paintings—and in some paintings the dots describe rain, floodwaters and other landscape features. The application of the dots is a meditative process during which the painter evokes the spirits and sings the songline, or dreaming track, pertaining to the narrative. Despite the success of Aboriginal art, here and abroad, there remains deep misunderstanding of the traditions that inform it. The dot and other patterns or motifs used in Indigenous art, are not merely an artistic device or technique, but are integral to an existential story. They are the cultural DNA in a painting, fingerprinting it forever to its custodian. More often than not this notion of ownership and custodianship extends beyond the individual artist or artists who created the work. It may include specific segments of the community and members of their family, some of who may have participated in the painting process. For the uninitiated making sense of the provenance of some Indigenous paintings can be daunting. Photographs of the artist with the work, or beside the work, should not be interpreted as definitive proof that the artist actually painted the work. People who appear in photographic documentation may have been manipulated or treated unfairly by unscrupulous dealers. They may be the custodians of the story but may not have participated in creating the painting. Adding to an already complex situation is that many Indigenous artists are unused to having their work evaluated in terms of monetary worth. Demonstrated painting expertise, individual style, the size of the work, or the selected colour palette has little meaning to artists painting their traditional stories. The notion that a hastily worked painting with splashes and drips is worth less than a painstakingly executed one is hard to understand. To Indigenous eyes they depict the same thing and are therefore equally valuable. But in our commodity-driven market these aspects are directly used to determine monetary value, and in a world where bigger is best and more is even better, the disconnect between the artist and the art market becomes a structural one. For the uninitiated making sense of the provenance of some Indigenous paintings can be daunting. Adrian Newstead OAM, Director of Coo-ee Aboriginal Art Gallery and long-time advocate for Indigenous art, explains that the art world is an elitist construct. Artists become ‘collectable’ according to the number of exhibitions they are given at reputable galleries, along with the list of awards they receive, and the collecting institutions their work is acquired by. He was one of a number of speakers at last year’s forum on Ethical Trade in Indigenous Art hosted by Leichhardt Council. 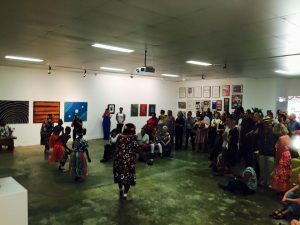 Newstead asserts that buying direct from the federally-funded Art Centres (such as those represented by Desart and ANKAAA) can erode the market value of an artist’s work in the primary market. As do the prices received in low quality auctions when works flow back into the market as collectors sell off poor quality paintings with dubious provenance. But his was not the only view expressed. There were dissenters: Curator Franchesca Cubillo and artist Lizzie Marrkilyi Ellis advocating strongly for visiting and buying direct from the Art Centres. Others questioned what ethical practice means in a world full of inequity. To listen to the arguments for and against buying Aboriginal art direct from an Art Centre, go to the online transcript and audio. It’s important to understand the lack of enterprise opportunities faced by indigenous people living in remote areas, and the role of the Art Centres. It is important to be confident about the transparency and honesty of relationships between individual Aboriginal artists who chose to works outside of the Art Centre system and the agents, dealers and galleries who represent them. It is helpful to understand the way the primary art market intersects with those networks. Art Centres which represent hundreds of artists, regulate production and document the artworks produced, and in many cases support the educative, health, and housing needs of the community. They are the arteries by which services and supplies are procured and are a critical hub in the lives of people who live in remote communities and close by on their traditional lands. If you choose to buy direct from an Art Centre, don’t be tight-fisted. Buy the art you like at the price that is asked. In communities where artists paint to live, collective responsibility means that what an artist earns is shared. Be aware that children may be ill, elders needy. Closer to the city you can buy art through reputable commercial galleries or from Art Centres participating in industry art fairs. The commercial gallery sector and the secondary market (which includes auction houses and art consultants) play an important role in setting and maintaining the retail market value of each artist’s work. This is vital to the long-term reputation of individual artists and the viability of remote community Art Centres. So informed and ethical buying may involve a long learning curve. If you are in Sydney visit Boomalli Aboriginal Artists Cooperative in Leichhardt. They specialise in supporting the work of NSW Indigenous artists and the artists directly. They have a stock room, a large exhibition space, and they’re involved in various regional projects. Be clear about what you want and choose the outlet to suit your needs. If you want your money to go to a particular community, then buy from an Art Centre. If you are after the best work of an individual artist work buy from the primary market. Have a look at what’s in our national collections. Visit commercial galleries with good reputations, expertise, and industry standing in dealing directly with the Art Centres, and who invest in communities and mentor artists. Be informed about provenance. Ask questions about the documentation provided by galleries and auction houses. Consult the professional arts industry advocacy bodies such as the Indigenous Art Code, the Australian Aboriginal Art Association, the Australian Commercial Galleries Association and the Art Consulting Association of Australia. They ensure you are buying ethically sourced artworks at a realistic market value.